This is a bit rich, given that most of the British press is viscerally opposed to the EU. It has been that way for decades, and newspapers have regularly bent the truth or told outright lies about the villainy of Brussels. The government's one leaflet will not undo a generation's worth of propaganda from the other side. Even leaving that aside, I have very little sympathy with the Brexit complaints. The government is not neutral in this matter, and it is entitled to present its point of view. Ahead of the Scottish independence referendum in 2014, official leaflets were neatly balanced. The devolved Scottish government supported a Yes vote, and the UK government favoured No. They produced separate leaflets, setting out their respective positions, and delivered one to each household. In this case, the situation is different. Only Westminster can decide to deliver an official leaflet to every household in the UK. The Brexit campaign cannot dictate the UK government's position, because of the outcome of the latest general election. As such, it is a case of democracy in action. In the 2015 general election, the party positions were clear. Labour, the Liberal Democrats, and the Scottish and Welsh nationalists were solidly pro-EU. The Conservatives grudgingly united behind David Cameron's "negotiate and decide" stance. Only UKIP unequivocally supported a British exit. UKIP hoped to achieve a breakthrough in the general election. They hoped to win a dozen or so seats, and hold the balance of power in a hung Parliament. If Cameron were dependent on UKIP votes to sustain his government, he would have no choice but to respect their wishes on the EU referendum. It was not to be. UKIP won a grand total of one MP. Of course, this reflects the unfairness of the British electoral system, and UKIP did receive 12.7% of the vote. Then again, under that same system the Tories won a majority with 36.8% of the vote, which among other things enabled them to hold this referendum in the first place. In electoral terms, I'm not convinced the anti-EU forces have been hard done by. 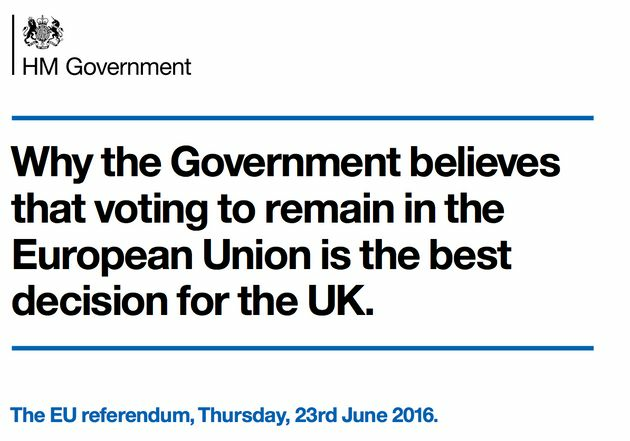 Whether it is tactically a good idea for the government to produce a pro-EU leaflet is another question. I am more ambivalent on this point, and will look at it in another blog post. But under the British electoral system, the government's mandate is clear, and so is its authority to distribute this leaflet. It does perhaps highlight the absurdity of the government calling for a referendum on whether to change something while supporting the status quo. It would be a bit like the SNP government in Scotland having a referendum on abolishing the Scottish Parliament and reverting to direct Westminster rule (except, I suppose, the difference is that a substantial proportion of the Tory party, albeit not many of the Cabinet, do want out of Europe, whereas I doubt anyone in the SNP wants to abolish the Scottish Government). That didn't stop Ireland from voting No the first time around, which is a cautionary tale for our own leaders, especially since this referendum doesn't get a do-over. I guess at one time in the distant past we might have imagined a Holyrood Labour / Green coalition holding a referendum with the First Minister leading the no campaign. Come to think of it, wasn't the AV referendum like that? Don't think the government officially supported the no campaign in that though. If the Greens had ever asked Labour for an indyref as the price of coalition at Holyrood, I'm pretty sure Labour would have told them to get stuffed and tried to rule as a minority government. The Greens have plenty of other policy wishes which Labour *could* accommodate, and independence isn't central to them the way it is to the SNP, so in practice I imagine they would have come to terms. In certain US states (eg. California), a referendum can be triggered by sufficiently many signatures on a petition. I think in those cases it's fairly routine for the government to campaign for a No vote.